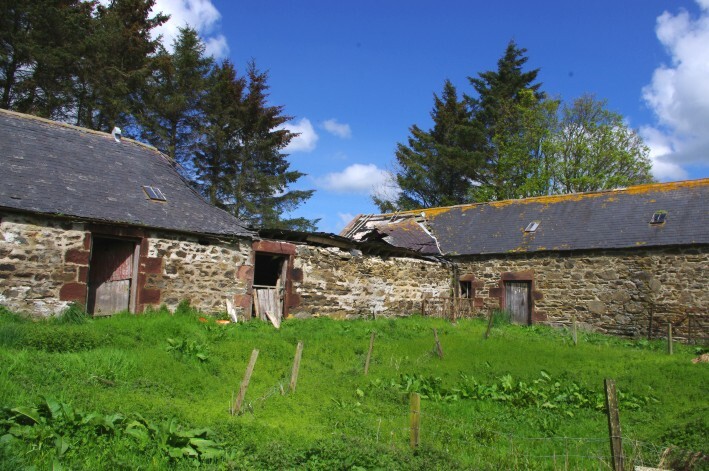 Farm House with Annexe and land extending to 15.37 hectares (37.98 acres). 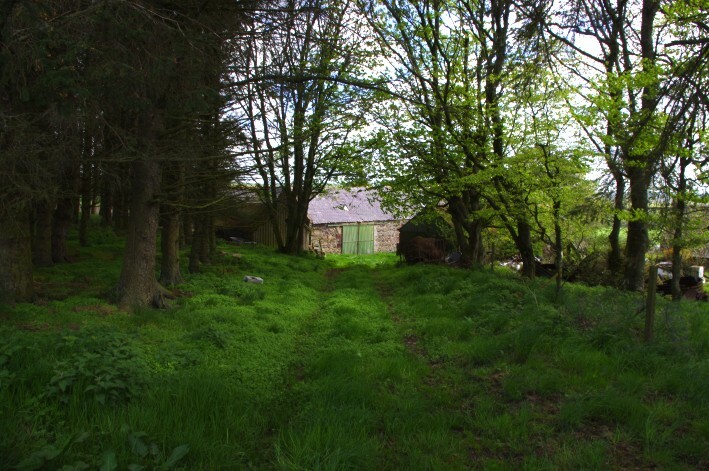 Farmhouse comprising: Ground flr: V/bule. Hall. Sitting rm. Office. Dining kitch. Bathrm. Lounge/Dining rm. 1st flr: 3 Bdrms. Annexe : Hall. Lounge. Kitch. Cloakrm with wc. Bdrm. Bathrm. Various Outbuildings. Price over £420,000 Entry by arr. Viewing Mrs. Stickels 01464 841492. (EPC band - G). One and a half storey Traditional Farmhouse. 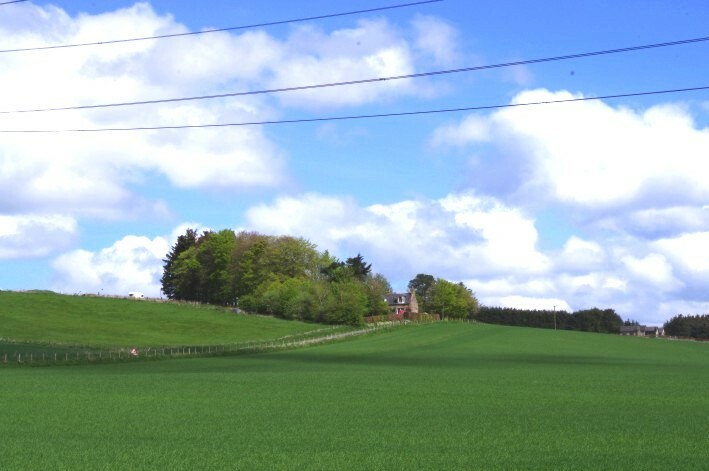 Farmland extending to 15.37 hectares (37.98 acres). 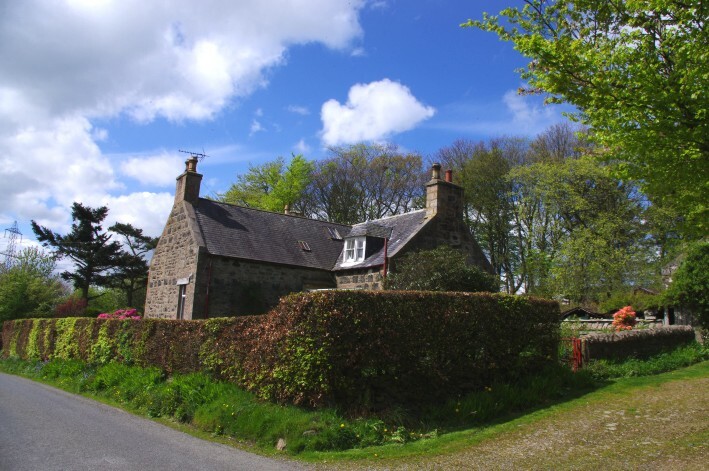 SITUATION – The Farm of Knowley enjoys an elevated position overlooking beautiful Aberdeenshire Agricultural farmland and the Bennachie Range approximately 9 miles north of Inverurie and 13 miles southeast of Huntly and lies within commuting distance of Aberdeen. Inverurie and Huntly are both located on the main A96 Road and on the main rail line between Aberdeen and Inverness. Both Towns have health facilities including Community Hospitals and a choice of major chain Supermarkets and opportunities for dining out, sports and leisure facilities. There is a nearby Primary School at Rayne North and Primary and Secondary Education are available at Inverurie Academy and The Gordon Schools Huntly. 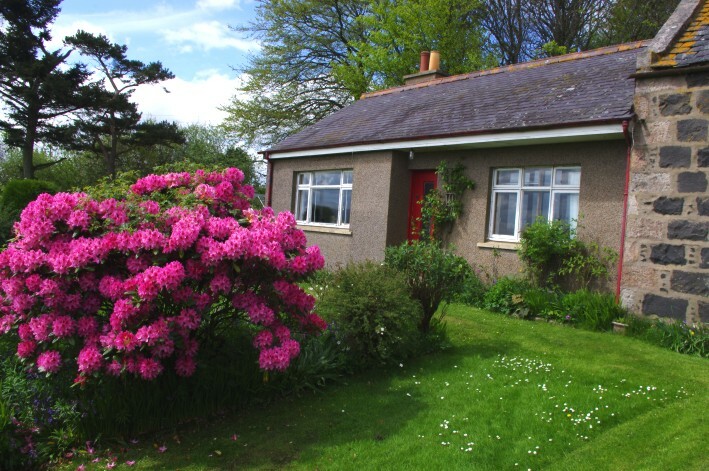 Huntly has a Golf Course, fishing on the Rivers Deveron and Bogie, bowling, cricket, football, swimming pool, skiing at the Nordic Ski Centre and is a popular tourist centre in the Summer months with access to National Trust and Historic Scotland sites including its own Castle. 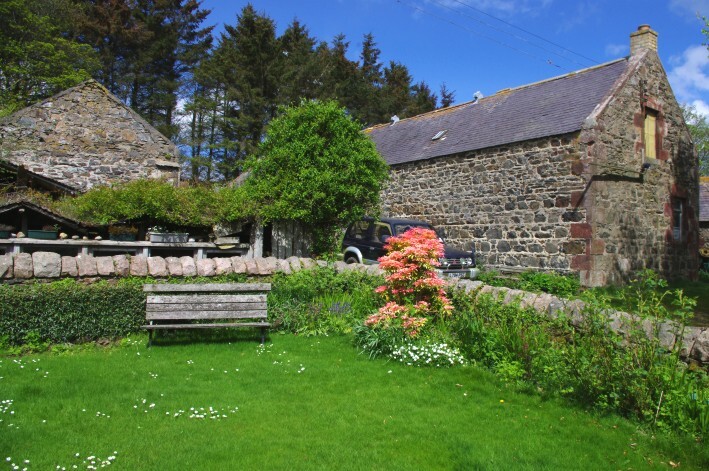 It is also a good base for day trips to Royal Deeside, Strathdon and the delightful fishing towns on the Moray Firth. Directions – from Inverurie take the B9001 heading to Rothienorman and branch onto the A920 road sign posted to Culsalmond. 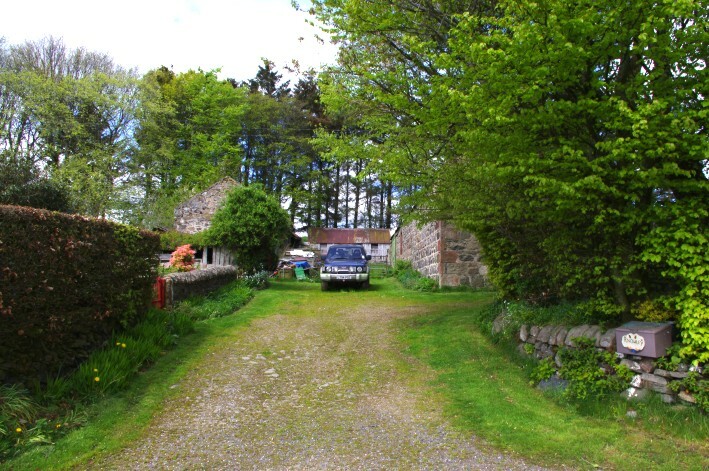 Knowley is located off the A920 via a minor road sign posted to Baldyquash. At the crossroads turn left and Knowley is located on the right hand side along this road. Alternatively, if travelling from Huntly take the A96, turn left at Culsalmond onto the A920. Shortly after the turnoff to Rayne take the minor road sign posted for Baldyquash. 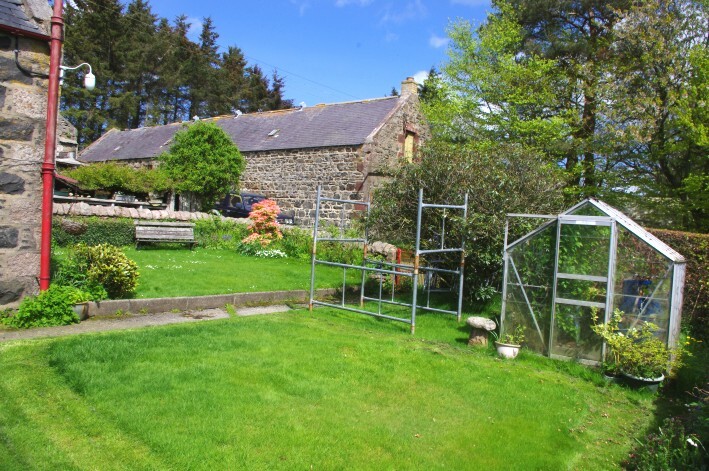 Knowley Farm, Meikle Wartle – In an elevated position with fantastic views over the surrounding countryside and towards the Bennachie Hill Range, Knowley lies in a well established farming area with the surrounding land predominately used for arable, rough grazing and woodland. 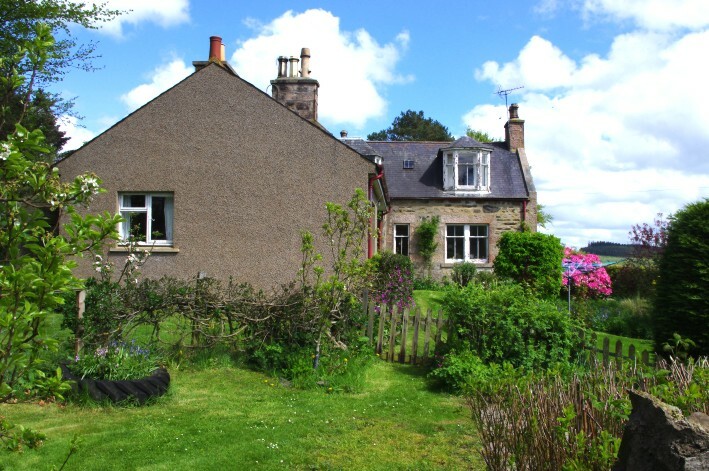 The property comprises a Traditional detached Farmhouse with a modern one-bedroom annexe. There are a range of outbuildings suitable for development provided the appropriate Local Authority consent and approvals are granted (No guarantees are given). 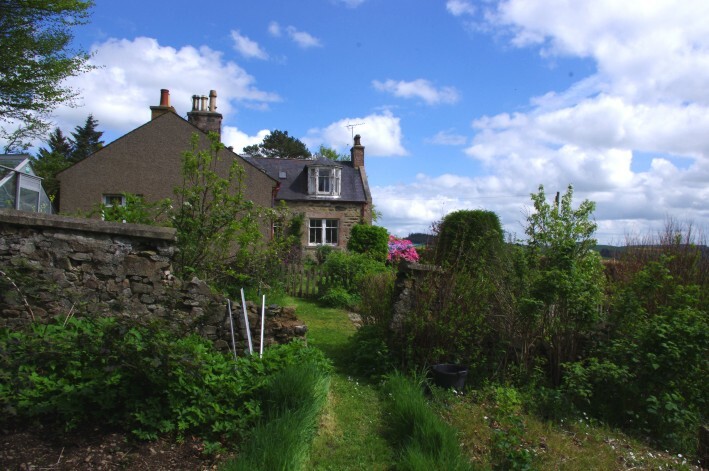 The farmland extends to approximately 15.37 hectares (37.98 acres). The owners have let out the farmland in the past under short-term grazing lets. Entrance Vestibule – Matwell. Partially glazed door leads into the Hallway. Hallway – With doors leading off to all rooms on the Ground Floor and stairway to the Upper Floor. Sitting Room – measuring 3.78m x 4.93m or thereby. Dual aspect windows with secondary glazing to front and side and wood panelling surround offering fine views over the surrounding countryside. Fireplace with marble outer surround and mantel and tiled inner surround. Stove with open fireplace behind. Cornicing. Alcove to the side of the fireplace. Office – with window overlooking the garden. Shelving. Dining Kitchen – measuring 4.80m x 3.50m or thereby. Traditional farmhouse style doors. Oil fired stove. Unit with stainless steel sink and drainer. Dual aspect windows to front and side. Space for normal Kitchen appliances and storage recess. A farmhouse style door leads to the Outer Vestibule. Pantry with shelving. Outer Vestibule – leading to a further storage room and W.C.
Bathroom – traditional W.C., wash hand basin and bath with shower over, rail and curtain. Window to rear. Fitted shelved cupboard. Wall heater. Towel rail. Small storage cupboard. Lounge/Dining Room – measuring 4.86m x 3.64m or thereby. 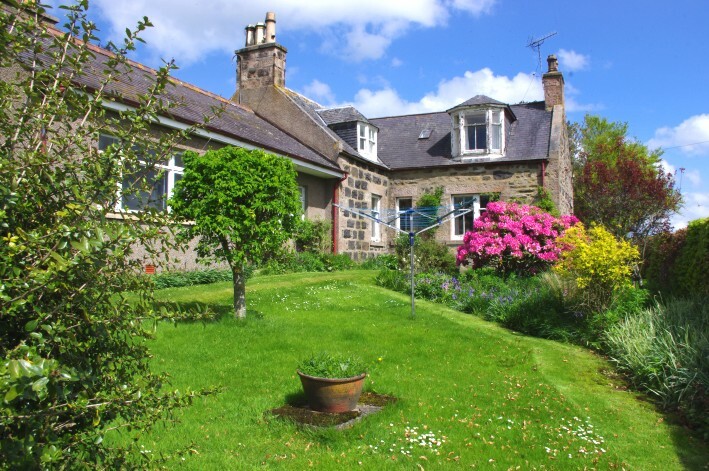 Window to front with original wood panelling surround affording fabulous open views across to Bennachie. Original feature fireplace with stone outer surround and mantel, tiled hearth and inner surround housing wood burning stove. Recess with shelving. Original cornicing. A partially glazed door leads to the attached ANNEXE. UPPER FLOOR – A traditional carpeted staircase from the Hallway leads to the Upper Landing which has three separate storage cupboards and a cupboard housing the cold water tank. Bedroom 1 – measuring 4.43m x 3.67m or thereby. Coombed ceiling. Window with fantastic views over the surrounding countryside to Bennachie. Bedroom 2 – measuring 4.42m x 3.62m or thereby. Coombed ceiling. Window to front. Hot water tank. Bedroom 3 – measuring 3.88m x 4.81m or thereby. Coombed ceiling. 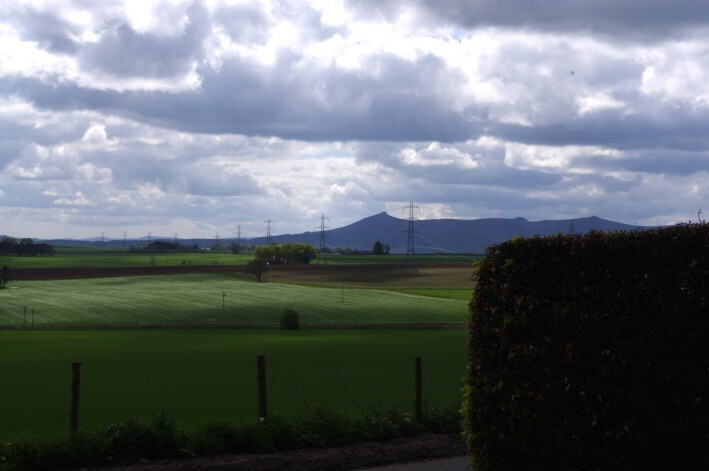 Window overlooking garden, countryside and Bennachie Range. There are two separate Storage Rooms with skylights. Hallway with all rooms accessed off. Lounge – measuring 3m x 4.15m or thereby. Large picture window with secondary glazing affording the same superb views as from the main Farmhouse. Fireplace with cast iron surround and open fire. Alcove with shelving. Fitted cupboards housing hot water cylinder. Kitchen – measuring 3.35m x 1.89m or thereby. Unit with stainless steel sink and drainer and cupboard below. Window overlooking garden. Solid fuel “Superheat” stove. Separate wall storage unit. Space for appliances. Partially glazed door leads to a Glazed Porch with farmhouse style door to the rear garden. W.C. – comprising W.C. and wash hand basin with glazed window. Bedroom – measuring 3.54m x 3.12m or thereby. Window overlooking garden and countryside. Cupboard with hanging rail and shelf. Bathroom – measuring 1.79m x 2.79m or thereby. Bath with tiled splash back. Glazed window with secondary glazing. 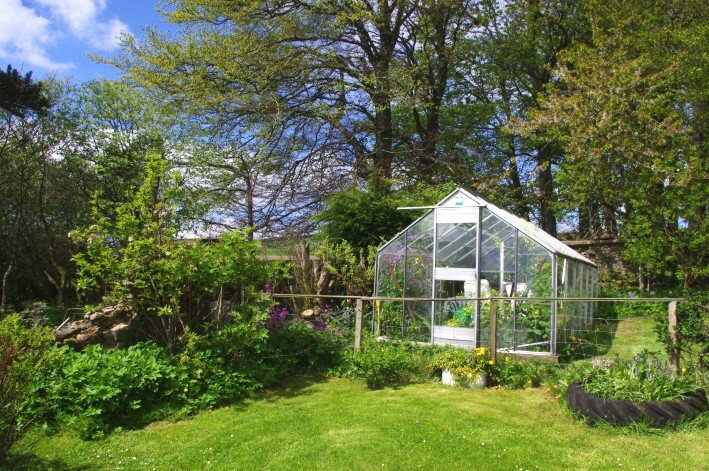 OUTSIDE:- The Front Garden area is traditionally laid out with lawns, flower beds and greenhouse. 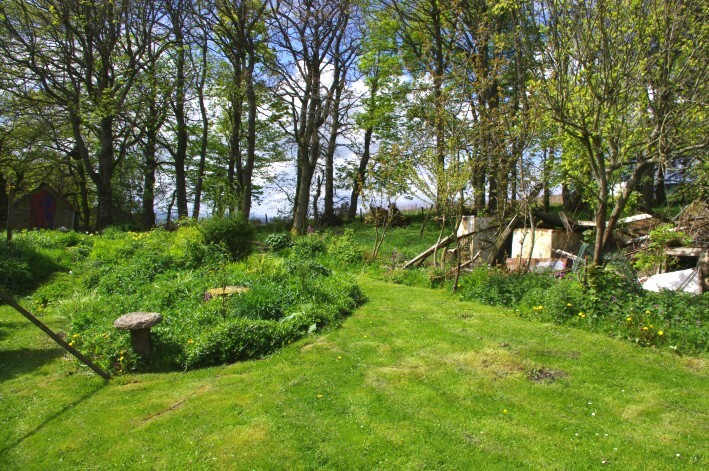 The Rear Garden – comprises a rockery with wild garden and woodland areas beyond. 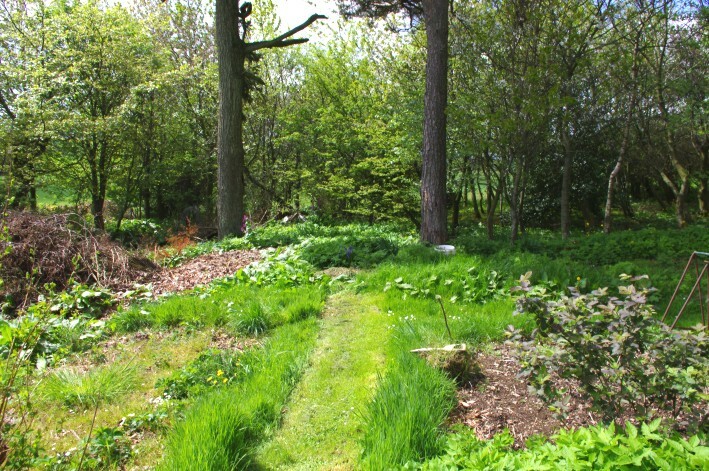 There is a side garden with lawn and sustantial flower borders. 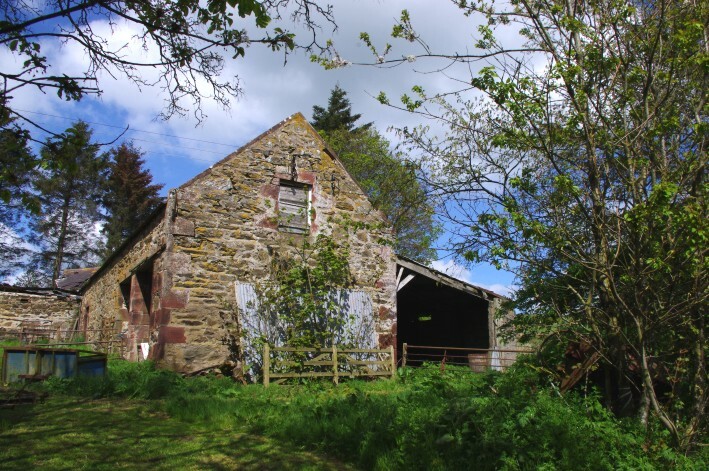 THE OUTBUILDINGS – The Farm Outbuildings comprise a range of stone buildings with potential for repair or conversion to alternative use subject to obtaining Planning Consents from the Local Authority (No guarantees given that consent will be granted). 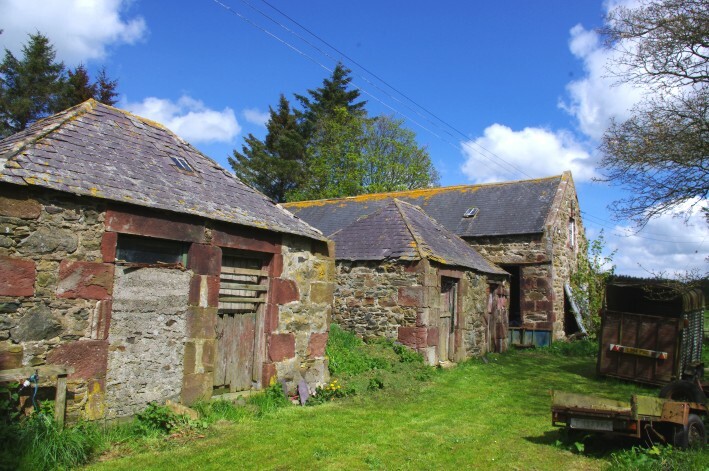 There is a Traditional Stone and Slate U-shaped Steading with single byre to the east, double byre along the back and barn to the west. Lean-to store, two small stone and slate Piggery buildings and stone Barn. 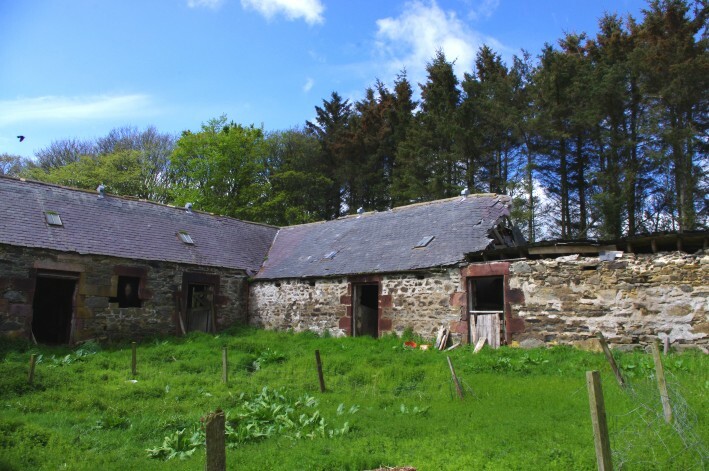 FARMLAND – extending to approximately 15.37 hectares (37.98 acres). The Macaulay Institute of Soil Research have classified the land as Grade 3.2. albeit Fields 1 and 2 are more elevated with thinner stony soil than fields 3, 4 and 5. The land lies at an altitude of between 150m and 250m above sea level with a south to south easterly aspect. In the past the land has been used for cereal cropping and grass and let under Grazing lets. Note – There is a lattice electricity pylon in Field 2. Services - Private water. Private drainage. N.B. An application for a wind turbine on the adjoining farm at Baldyquash is under consideration.